Finals are coming I need to pass my math class, my mom is asking if I will pass (STRESS) I need help, no body really understands. I go to get help but I still do bad on the test. If I get an F no promotion my platoon leaders tell me to keep trying so I will. My mom said no phone if I fail why my phone anyways going to lunch for help again. Editor’s Note: This post was written by a cadet currently attending Southeast Academy High School (SEA). 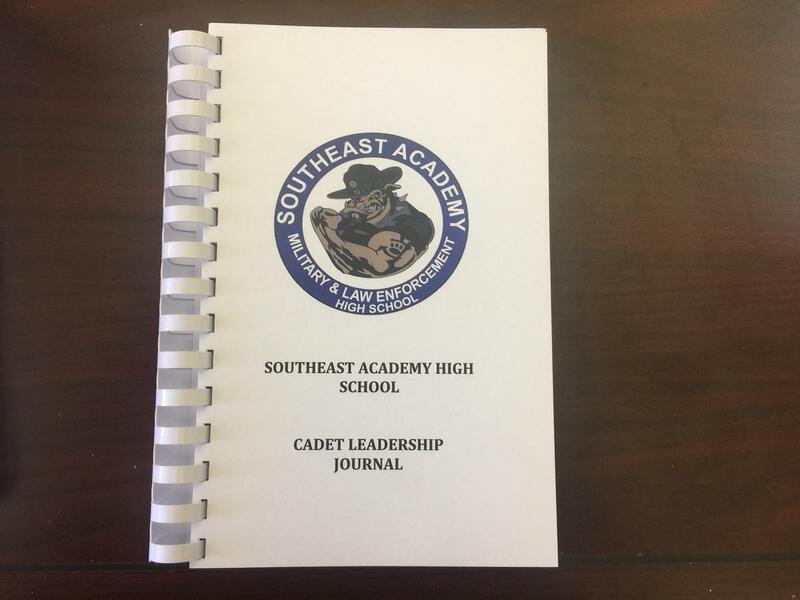 The thoughts and opinions expressed in this Journal do not necessarily reflect those of SEA or the NLMUSD and are the sole opinion of the author.Cadet Journals are written by personnel in a challenging high school environment with little time, so please excuse grammar and punctuation in the above article. The staff at Southeast Academy do not edit the journals in any way, so as to ensure authenticity of the content and messages. Works hard, really good at sounding off, puts out in everything she does although she has an fit if you give her motivation. So Please take in consideration of promoting her! Not just a regular day at Southeast Academy, we had a chance to talk about our time at SEA and how it had help us. Our platoon is very close at first no one wanted to say anything until our platoon commander told us her story. She was never promoted because of grades for two years. She said SEA has helped so much to never give up and always ask for help. She said if it was not for SEA she could have dropped out of high school. WOW she said her GPA overall is 3.3 and she plans to go to college and work in the medical field. I never knew how hard she worked, sometime I feel the same way. I know if I continue to work I also can be a platoon commander. I have her as my example thank you for this chance and I hope I can do it. Happy Thanksgiving to me, my family and my SEA family. I barely finish my homework this morning. I should have done my work instead of playing Fortnite. When formation started my Platoon Commander put me as assistant which shocked me, but I still tried my best. Today I am really worried to go to school because I did not do my homework.....I completed my homework in time for formation now I am taking squad leader, I finished inspection and it was quite fun, but I still have a lot to learn and improve upon. I said I would wright in this book on a day to day, but I got lazy, anyway they took me off of assistant squad leader because I messed up a lot today. Today I received a "Great Job" From My Squad Leader during morning inspection, it was nice to know someone notice how I am improving. Because I was not selected for promotion this last time I want to show my platoon leaders I am good enough to get rank CSC. Also we are a good platoon our leaders really care about our grades, I don't like it when they yell but it works. If I become squad leader I will try to not yell as much, but first I just need to stay focus on me (homework, uniform, and my time management) I really like to journal this helps me stay focus on my stuff. Today is Friday last day of Red Ribbon Week. The activities were very fun. The activities made everyone so competitive. Instead of participating in the activity at P.T. I'm going to be a judge, which is so fun watching each platoon on how competitive they get. In Pre-AP Lang we have a vocab quiz. I studied through out the week so I feel good about the test. So I got 4 questions wrong out of 25 so I got a B+ . ASB make a poster for MSgt Allard birthday. We go to go sing happy birthday. At the end of P.T the last Red Ribbon week activity alpha one Won again but alpha two will get them next time. But everyone had a great time a very competitive week. 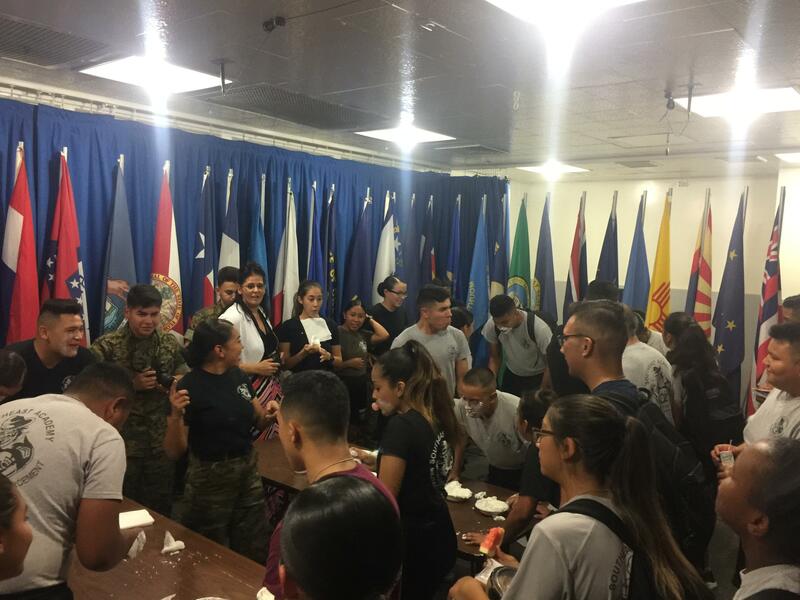 The entire Alpha Company took a big picture together and a few cadets threw water on our company staff while we were taking pictures so it was a great week. I can't wait for another spirit week.... Our Company Staff are always so motivated & very competitive which makes it more fun and they get every one pumped up and excited. What a great Day at SEA. Today is my Birthday it is also the day of promotions, I am nervous I don't want to mess up the ceremony. I am getting Cadet 2nd Class (CSC) I feel a bit special because I become a CSC and I turn 16ys old. MSgt Allard tells me in my 4th period class I will be doing my drill card the next day. In the morning I am squad Leader Asst. for CFC ..... It was fun and exciting. I did my drill card I got a 93% not completely bad. Upset because I wont get promoted again, My Platoon Commander said I need to get my grades up. I have a "D" in Ms. Kim class, Its the same thing test. I hate math but I want to get promoted. This is my second year in her class and I still can't get it. My Platoon Commander said she will help me after school, she said if I work hard on Math and get a "C" that should do it . I am determined to get a C by next report card 2nd semester I want to show my Mom I can do it. I am going to stay for tutoring today i hope everyone can see I am trying Ms. Kim and my Mom. On Tuesday October 23, 2018 I achieved the rank of a Corporal. Junior year was my year to execute my leadership skills, as a squad leader Ive learned tremendously especially about my cadets they motivate me every single day. Feels amazing having my bodies look up to me. I need to make sure my 2nd squad all become future leaders of Southeast Academy. Besides my squad I love my platoon staff they make B2 the best between freshmen and juniors year B2 Strong ! Editor’s Note: This post was written by a cadet currently currently attending Southeast Academy High School (SEA). The thoughts and opinions expressed in this Journal do not necessarily reflect those of SEA or the NLMUSD and are the sole opinion of the author.Cadet Journals are written by personnel in a challenging high school environment with little time, so please excuse grammar and punctuation in the above article. The staff at Southeast Academy do not edit the journals in any way, so as to ensure authenticity of the content and messages. RED Friday, I like how we support our cadets who are in the military plus I like the ice cream to, thank you SEA booster club! Late Start is not cool, I get here at SEA really early because my mom works so that means I have to sit and wait for school to start. Today I talked to friends about how we should start a Late Start Club so we can do stuff like a talent show or sell stuff to make money for our class may be we can sell hot food. Platoon Was we lost but its still is fun my platoon is motivated to win, maybe next time we have one more chance. I was also selected to get a promotion I am nervous the Battalion Staff is scary to me but my company commander said you got this. I hope he is right, if not I hope I get it next promotion at the 3rd quarter. MSgt Allard said you must get accepted back to SEA I hope I get to come back next year.